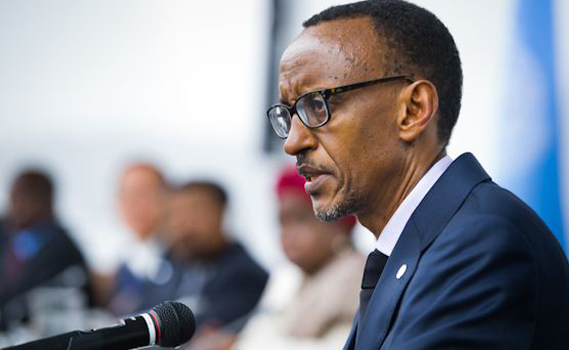 President Paul Kagame has called on African leaders to unite and seek for more gains for the continent. Kagame urged Africans to pursue common goals and work together to eliminate activities that lead to conflicts and divisions among them. Kagame singled the syndrome of prioritizing national interests that may hamper the continent from realizing the benefits and fruits that accrue to regional integration. “Our goals will not be attained if we get lost in counterproductive divisions and prioritize narrow interests over common good,” Kagame said. Kagame was addressing today East African legislators at the fifth meeting of the third assembly of the East African Legislative Assembly at the Rwandan Parliament in Kigali. Kagame said total progress by individual nations leads to more gains for the East African region that is currently hosting conflicts traced from failure to respect constitutions and peace deals. “When the good progress made internally by each country is aggregated, the benefits are even better for everybody, integration is not a zero-sum game. When we work together, we are all better off, ” he said. The fifth EALA meeting sits at the time when Burundi and South Sudan, partner states of the East African Community, are torn by conflict sparked by overturning peace agreements by the leaders. Burundian President Pierre Nkurunziza bid for an unconstitutional third term in April 2015 led to conflict that has claimed thousands of lives. Over 250, 000 Burundians have fled the country. Kagame lauded EALA for adopting Kiswahili as an official language in the East African region saying the language enhances the unity in the region. Kiswahili has now been introduced as a compulsory subject, the President told the African legislators. Meanwhile, Kagame said Africa needs an African Union (AU) that is capable of communicating the purposes, aspirations and position of Africa at the global stage. He announced that the AU entrusted the implementation of the Continent’s development agenda to the regional blocs. Apart from EAC others include SADC, ECOWAS, COMESA, CEN-SAN, IGAD, AMU and ECCAS. Kagame said the annual African Union Summit scheduled July this year will assess the progress of the implementation of Africa’s Agenda by the regional blocs, citing championing closer cooperation in the continent.